A bit of a departure from our usual fare but we acquired an original 1851 printing of The Works of James Gillray from the Original (Suppressed) Plates and have decided to move the volume along. As this is a specialty item well outside of our area of the business we would be just as happy to pass it along to a knowledgeable dealer or collector at a trade price. This offering is an original 1851 publication by H. G. Bohn as described below. While the binding is tight the folio covers are separated showing expected age and use with bumped corners. (A properly done half binding would easily restore the covers to the spine.) The bound plates remain in pleasing condition and will be best described by our photo illustrations. James Gillray, sometimes spelled Gilray (1756 or 1757-1815), was a British caricaturist and printmaker famous for his etched political and social satires. As a bit of history behind these outstanding 18th century satirical drawings : After the death of the artist the business was carried on by his widow until she retired and offered Giliray’s plates at auction. When the plates failed to meet reserve they remained unsold and in storage until the widow’s death. When the executors offered Gillray’s plates for the price of the copper, an enterprising publisher by the name of H. G. Bohn purchased the plates publishing two volumes the last of which was published in 1851 consisting of so calledsuppressedplates under the title The Works of James Gillray from the Original Plates. Twenty- five pages plus the title page are printed on one side of 63.5 cm x 48.3 cm heavy woven paper all bound in an elephant folio. As Gsllray’s suppressed caricatures feature sexual, satirical and politically outrageous subject matter, it was advised that the collection of suppressed plates were intended for gentlemen only and not for the delicate sensibilities of the female population. 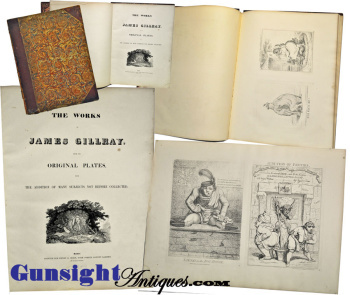 Entertaining, easily matted and framed, and collectible, complete works such as are offered here are seldom found as the vast majority of the folios were broken up for individual sale. It should be noted that while the regular Gillray prints from the Bohn printing seem to sell for between $25. and $35. each the suppressed prints as are offered here go much higher averaging $200. each. Buy with confidence! We are pleased to offer a no questions asked three day inspection with return as purchased on direct sales! Just send us a courtesy e-mail to let us know your item will be returned per these provisions and your purchase price will be refunded accordingly. Thanks for visiting Gunsight Antiques!